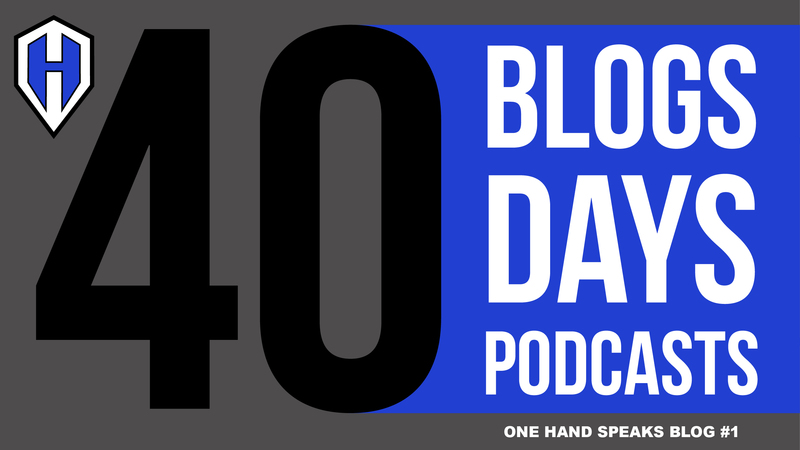 40 Blogs in 40 Days About My First 40 Podcasts! That’s Right! I will posting one blog a day featuring my first thirty podcasts from my One Hand Speaks Storytelling Podcast. At the same time I will also be posting my weekly podcast and blogging about it here. I am not 100% sure if I will be listing my podcasts in the order I published them but I will get to all of them. With what I have already published and what will be unfolding in the next 6 weeks I will have my first 40 podcasts blogged. Plus as a bonus I will getting ready to do a week of podcasts about my travels to Tibet and China right after these 40 days. I was on an 8 day Medical Support Mission in a local Tibetan village and spent time at the Dzogchen Monastery in Tibet. After that I traveled in China with 7 days at the Shaolin Temple. Many great stories to come in the next 40 days and more!! Why does this matter to you? Because my podcasts are funny and offer some sweet life lessons. Can I say that they are humorous and enlightening? Yes I can! Plus they have a positive and happy quality to them. My whole “One-Handed Hook” is that I love life. I love not having two hands. I love who I am. Yes, life can be real hard without two hands. Especially as a child growing up in this visceral mortal coil can of soup we call life. But I take the happier side of things. It is really a choice. I focus on positive thinking and the happiness a one-handed life brings to me and for others. In fact, not having two hands is a blessing. It allows me to be in a position to be the condition of other’s happiness and a source of inspiration. It is with this attitude and perspective I have had so much fun in life spreading joy, happiness, and humor in my day to day one-handed moments. You do not need to be missing a major body part to enjoy and benefit from this blog and my podcasts. All you got to do is listen. If you are missing a hand you might get some extra special things from my podcasts. There is a real quality to having some “common ground.” Even if you are missing a foot or arms or legs. If fact, any person with any disability has a relatively good chance of enjoying my podcasts. And I guess sometimes it is good to “wear another person’s gloves for a day.” Or do you always need to “walk a mile in my shoes?” Maybe you know someone with a disability like mine or similar to mine. A lot of inside tips you can get here! Maybe you are the parent of a child with a disability of any kind. Something in my podcast may offer you some insight. I have a mother who at times still feels unsure about the way I was born. Maybe you will share my podcast with someone you know who could benefit from a humorous story with a positive twist. AlejAndro on bicycle tour and an illustration of a deer about to get hit by a van. One Hand Speaks Podcast Episode 001. I think starting with my first podcast is a great place to begin. A long time ago in a galaxy far, far away… Well, it seems like that at times. I rode my bicycle from Seattle, Washington to my home town of South Bend, Indiana. Not quite an easy task overall. Especially with one hand. I went on the bike trek in solo mode. I went by myself. It took me 64 days total. I camped out each night. So many beautiful, cool, and unusual things happened to me. I will podcast about them as time unfolds. This first podcast is actually two short stories about my one handed traveling adventures. The first short story is about one of my experiences on a small speaking tour I did in the Pacific Northwest while driving my stick shift. The second story is about a very cool experience I shared with a good friend who I met up with on my solo bike trip. We ended up saving someone’s life. 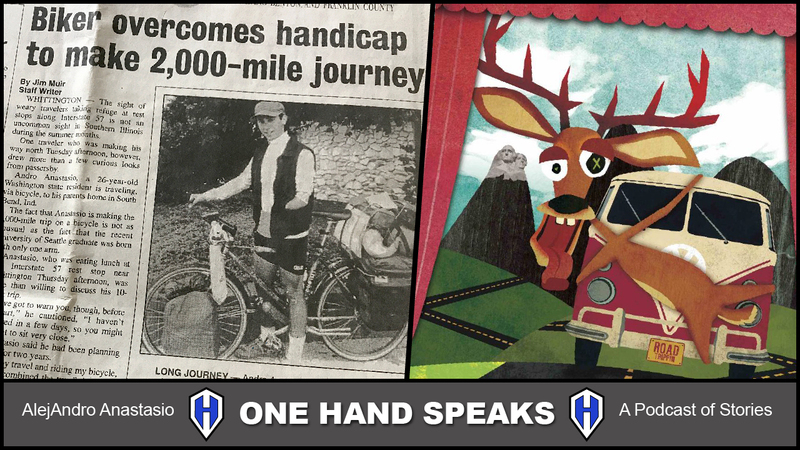 Both offer great insight to life with one hand and traveling with any kind of disability. This was a live recording in Boise, Idaho in the Linen Building for Story Story Night. It is nice to have a live audience and makes for a great first podcast. Please feel free to share this blog or my podcast and I invite you to comment with you opinion and feedback! Thanks! Sports Fitness Advisor – Scientifically Backed Fitness Advice for Sport and Life. Dzogchen Retreat Center – Dzogchen Khenpo Choga Rinpoche and the Dzogchen Lineage. Swan Valley, Idaho – Beautiful and pleasant place to stop on a cross country tour by bicycle. Boise Bicycle Project – I put it in here because this is a cool bicycle project in Boise, Idaho. The Disabled Traveler – Justin Skeesuck teaches you how to travel with limited mobility. Story Story Night – True stories, live. Boise, Idaho. Copyright © 2018. One Hand Speaks. All Rights Reserved.